Pinterest led me to this art lesson at The Forest Room. 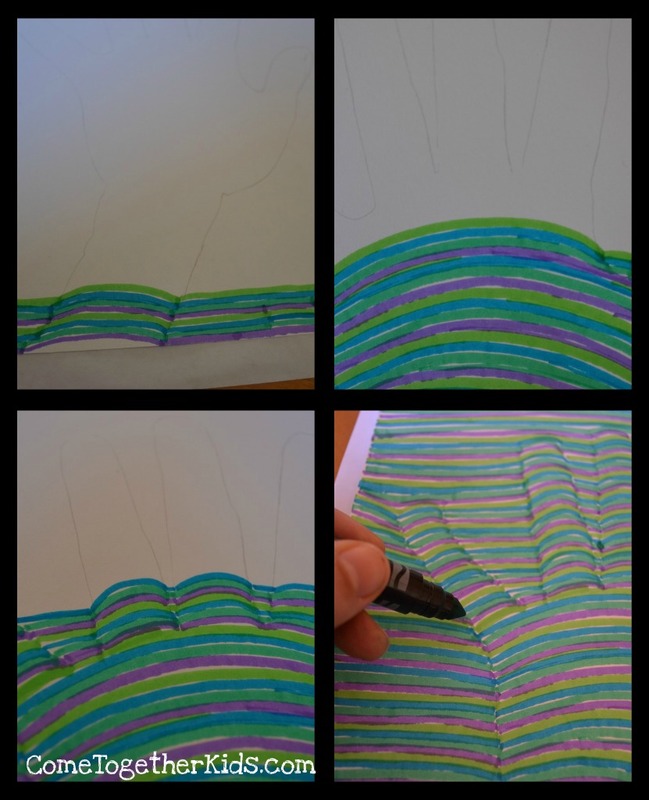 My kids love optical illusions and this project looked to be right up their alley. I've had the idea in my "to do someday" file until my oldest daughter and I did it together today when she was stuck home recovering from the flu. 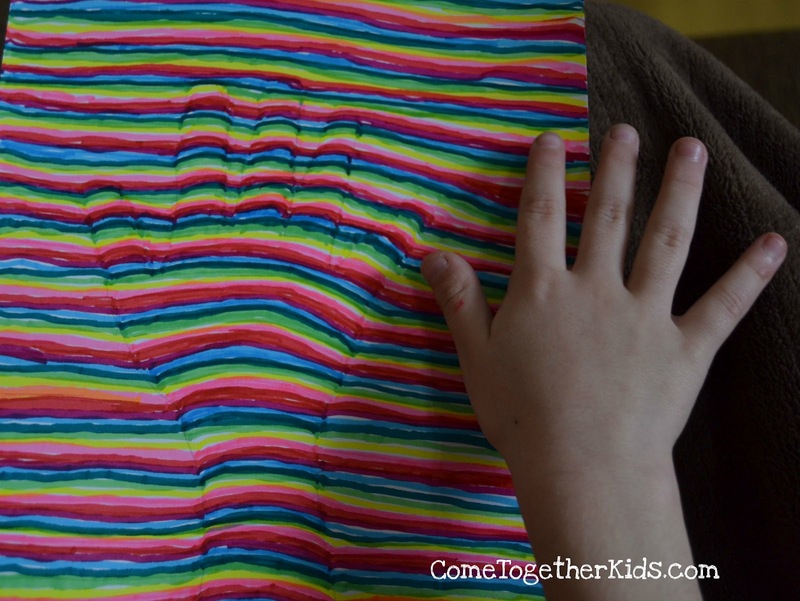 It was really fun watch our hands emerge and look almost 3D on a flat piece of paper. 1. 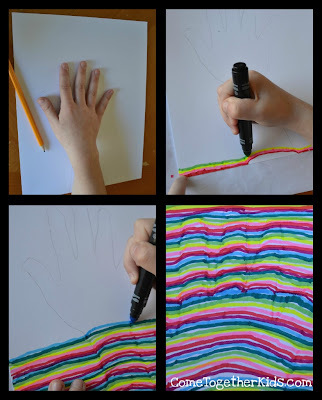 Trace your hand and a bit of your wrist in pencil. 2. 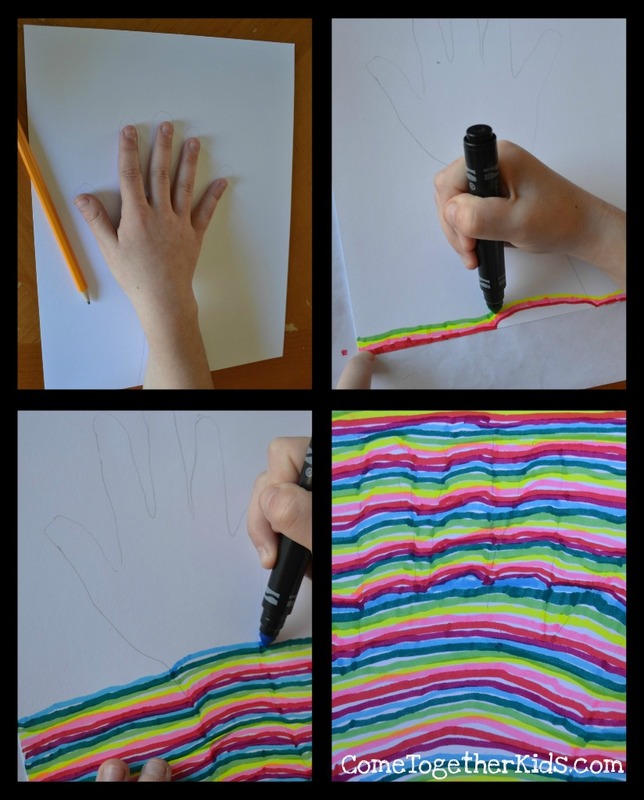 Using marker, draw a straight line across until you reach the pencil outline of your hand. Make a curve from one line to the next, then continue in a straight line. 3. 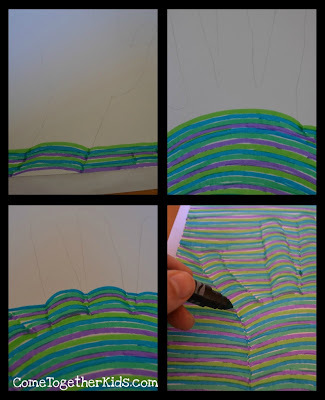 Continue making lines until the whole paper is covered, always making the lines curve within the outline of the hand. 4. If necessary, when you're finished, touch up and fill in any white spots that you missed. This is such a fun idea... my kids are going to love it! Wow, that looks so cool. A clever idea I look forward to trying! Laura, I love this SOOOO much! I'm such a sucker for hand prints AND these are cool! Thanks so much for linking it up. Very cool! My 7.5 yr old will love this, can't wait to show her, thanks! I'd say it probably took between 30-60 minutes. I think it's definitely do-able in a classroom, but it'll take some kids longer than others depending on how many colors they choose, how closely together they put their lines and how quickly they tend to work. 2 ideas to minimize the time: Keep the paper size as small as possible to reduce the amount of time spent filling in around the hand and use wide tip markers for fewer lines. May not look quite as dramatic, but would finish up more quickly. Some have short attention spans! This is an informative blog on optical illusion. It is really nice to discover a marvellous blog on illusion. Do my assignment expert is pleased to find a great blog. Students Assignment Help serves the best myassignmenthelp services for the students. We have the top assignment writers who offer excellent quality assignment writing services to the students.